I haven't always been a lover of squash or sweet potatoes, probably because we never ate them growing up. At times I'm still convinced that I don't like them, and then I eat things like Spicy Sweet Potato Wedges and those thoughts fly out the window. Sweet potatoes are especially good, diced up and subbed in along with chickpeas in place of chicken for my Slow Cooker Butter Chicken. Makes a great vegetarian curry. Another favorite is cutting sweet potatoes into fries and baking them. I love to serve them with a curried mayo as a dipping sauce. I'm not sure why curry and sweet potatoes are such best friends but they do go perfectly together. Maybe it's the lovely balance of warm spices with the sugariness of the sweet potato. Either way this is a fantastic application for some very humble ingredients like sweet potatoes, carrots and red lentils; all pantry items. 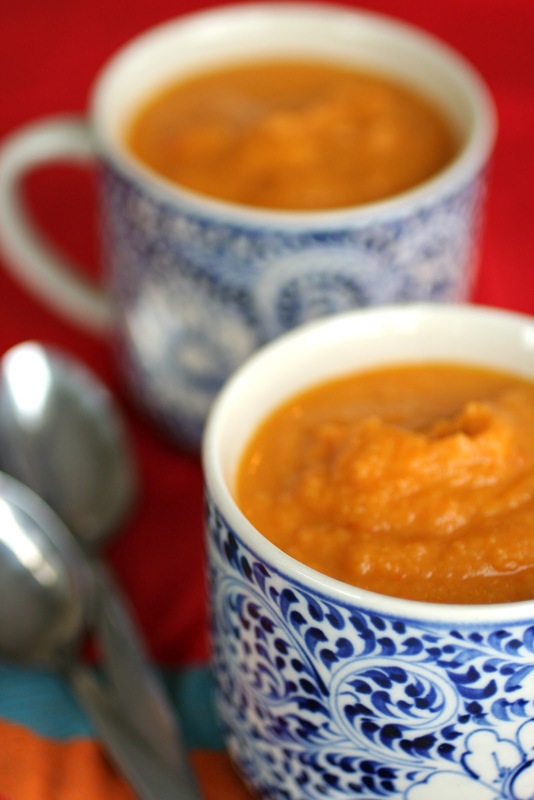 It's easy to toss the potato and carrot in the oven to roast along with whatever you are having for dinner and throw together this soup to have in the fridge for lunches or a quick dinner the next night. Preheat oven to 400 degrees. Pierce sweet potato all over with a fork and place on a baking sheet covered in aluminum foil. Roast for 40 minutes. Add the carrots to the pan, toss with some olive oil and roast sweet potato and carrots together for 20 minutes. Remove from the oven. (The sweet potato will definitely be done by now, but check to make sure your carrots are tender. If not continue to roast them until they are). Meanwhile, in a large pot over medium heat, add a bit of olive oil. Add the onion, garlic and ginger and saute until the onion is translucent, about 5 minutes. Add the curry paste and saute another minute or so, then add the chicken stock and red lentils and bring to a boil. Turn heat down to low and simmer for 15-20 minutes until the lentils are tender. Peel the skin off the sweet potato (should come off really easily) and place half of it in a blender, along with half the carrots and half the chicken stock/lentil mixture. Puree until smooth and pour into a serving dish. Place the rest of the sweet potato, carrot and stock/lentil mixture and puree until smooth and then add to the serving dish. Alternatively, if you have an immersion blender, puree everything right in the soup pot. Season to taste with salt and serve. Like I said, I like to roast my carrots and sweet potato while I'm making dinner. After dinner, I finish the soup and put it in the fridge, which makes it taste even better the next day since the flavors have had time to develop. While you could easily just simmer the sweet potato and carrot in the chicken broth, roasting just enhances the caramel flavor in both the root veggies. The curry isn't hot or super pronounced, just a nice subtle warmth to add to the sweetness. My husband and I loved it (both times I made it in the last week and a half), and I was even more happy to hear my kids say "yummy soup Mommy!" Thank you Facebook Fans for your awesome meal suggestions! At what point do you add the curry paste? Thanks for catching that! I just updated it. You add the curry paste after the onions and garlic have sauteed a bit.